Recently, Bro. 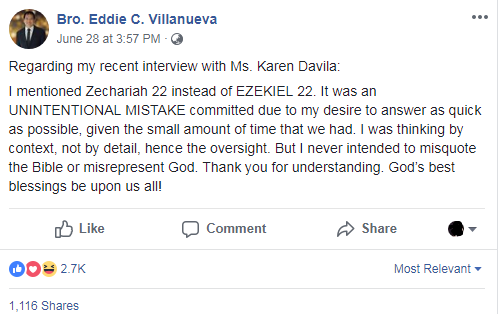 Eddie Villanueva of Jesus Is Lord was calling president Duterte to have a public apology for his blasphemous utterances about God in a TV program interview with Karen Davila. Many Filipino who have watched the interview felt disappointed for what Bro. Eddie said because according to the pastor everything he said is based on the Bible particularly in the book of Zechariah, chapter 22. There is no such thing as Chapter 22 as the book of Zechariah has 14 chapters only. People who expressed their insights on social media are demanding Bro. Eddie Villanueva to have his own public apology to the Filipinos and his millions of followers. 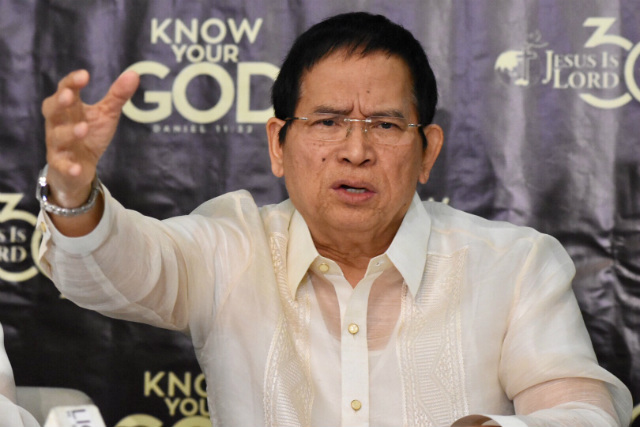 Villanueva's book of Zechariah with more than 14 chapters can be compared with the excel sheets of Trillanes. Many people argued that Villanueva could be our Lord God after adding fancy chapters in Zechariah. "He must be our God who wanted to continue his words in the Bible," Fred said. Nevertheless, Eddie has to go back again reading the books of the Old Testament especially the minor prophets, because there is no chapter 22 in the book of Zechariah. "This is a sin," a commentator insisted. And if any man shall take away from the words of the book of this prophecy, God shall take away his part out of the book of life, and out of the holy city. After became viral and gain a lot of criticisms, Bro. Villanueva posted on his Facebook page. "I mentioned Zechariah 22 instead of EZEKIEL 22. It was an UNINTENTIONAL MISTAKE committed due to my desire to answer as quick as possible, given the small amount of time that we had. I was thinking by context, not by detail, hence the oversight. But I never intended to misquote the Bible or misrepresent God. Thank you for understanding. God’s best blessings be upon us all!" he said.